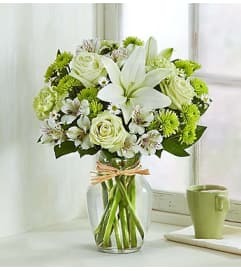 Better Homes & Gardens Something Blue Bouquet. 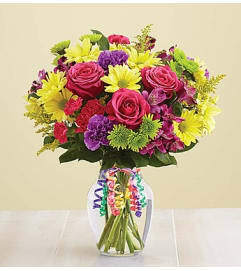 A rush of light and sky, this gorgeous sunlit flower bouquet is ready to make that perfect impression. 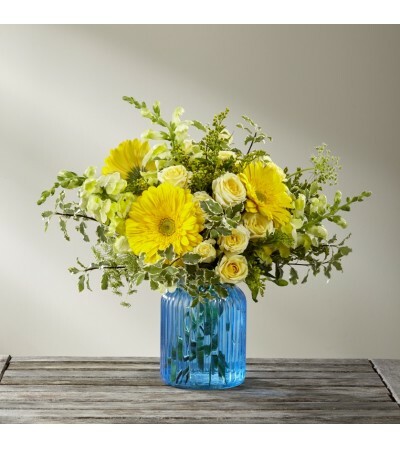 Considered the happiest flower on earth, yellow gerbera daisies take center stage in this flower arrangement sharing the spotlight with pale yellow spray roses, yellow snapdragons, solidago, Queen Anne's Lace, and lush greens. Presented in a brilliant blue glass vase to make this gift boldly stand out from the rest, this flower bouquet is ready to create a winning thank you, thinking of you, engagement, or wedding gift.